"Obie" redirects here. For other uses, see Obie (disambiguation). The Obie Awards or Off-Broadway Theater Awards are annual awards originally given by The Village Voice newspaper to theatre artists and groups in New York City. In September 2014, the awards were jointly presented and administered with the American Theatre Wing. As the Tony Awards cover Broadway productions, the Obie Awards cover Off-Broadway and Off-Off-Broadway productions. 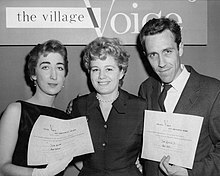 The Obie Awards were initiated by Edwin (Ed) Fancher, publisher of The Village Voice, who handled the financing and business side of the project. They were first given in 1956 under the direction of theater critic Jerry Tallmer. Initially, only Off-Broadway productions were eligible; in 1964, Off-Off-Broadway productions were made eligible. The first Obie Awards ceremony was held at Helen Gee's cafe. With the exception of the Lifetime Achievement and Best New American Play awards, there are no fixed categories at the Obie Awards, and the winning actors and actresses are all in a single category titled "Performance." There are no announced nominations. Awards in the past have included performance, direction, best production, design, special citations, and sustained achievement. Not every category is awarded every year. The Village Voice also awards annual Obie grants to selected companies; in 2011, these grants were $2,000 each to Metropolitan Playhouse and Wakka Wakka Productions. There is also a Ross Wetzsteon Grant, named after its former theater editor, in the amount of $2,000 (in 2009; in 2011 the grant was $1,000), for a theatre that nurtures innovative new plays. The first awards in 1955-1956 for plays and musicals were given to Absalom (Lionel Abel) as Best New Play, Uncle Vanya, Best All-Around Production and The Threepenny Opera as Best Musical. Other awards for Off-Broadway theatre are the Lucille Lortel Awards, the Drama Desk Awards, the Drama League Award, and the Outer Critics Circle Awards. As of September 2014, the Obie Awards are jointly presented by the American Theatre Wing and the Village Voice, with the Wing having "overall responsibility for running" the Awards. Obie Award ceremonies have been held at Webster Hall in Manhattan's East Village since the 2010-2011 season. ^ "OBIE Awards for Off-Broadway Will Be Given May 19 | Playbill". Playbill. Retrieved 2017-11-08. ^ "Eric Bogosian & Kristen Johnson To Host Obie Awards, May 18 | Playbill". Playbill. Retrieved 2017-10-27. ^ "Richard Foreman Wins Best Play Honors at 1998 Village Voice Obie Awards | Playbill". Playbill. Retrieved 2017-11-08. ^ "Durang, Chalfant, House/Lights Win 1999 OBIE Awards For Excellence Off-Bway | Playbill". Playbill. Retrieved 2017-10-27. ^ "Durang, Chalfant, House/Lights Win 1999 OBIE Awards For Excellence Off-Bway | Playbill". Playbill. Retrieved 2017-11-08. ^ "Claudia Shear to Host 2000 OBIE Awards, May 15 | Playbill". Playbill. Retrieved 2017-10-27. ^ "Claudia Shear to Host 2000 OBIE Awards, May 15 | Playbill". Playbill. Retrieved 2017-11-07. ^ "Seldes and Murray to Host 2001 OBIE Awards, May 21 | Playbill". Playbill. Retrieved 2017-10-27. ^ "Obie-Won". TheaterMania.com. Retrieved 2017-11-07. ^ "The 2002 Obie Awards, Honoring Off-Bway, Presented May 20 | Playbill". Playbill. Retrieved 2017-10-27. ^ "The 2002 Obie Awards, Honoring Off-Bway, Presented May 20 | Playbill". Playbill. Retrieved 2017-11-07. ^ "Ed Norton, Rosemary Harris, BAM, Talking Heads Among 2003 Off-Broadway Obie Awards Winners | Playbill". Playbill. Retrieved 2017-10-27. ^ "Ed Norton, Rosemary Harris, BAM, Talking Heads Among 2003 Off-Broadway Obie Awards Winners | Playbill". Playbill. Retrieved 2017-11-07. ^ "2003-2004 OBIE Awards Bestowed at Webster Hall". TheaterMania.com. Retrieved 2017-10-27. ^ "Kurtz and Esparza to Host 2004 Obie Awards Ceremony May 17 | Playbill". Playbill. Retrieved 2017-11-07. ^ "Jimmy Smits to Host Village Voice Obie Awards May 16 | Playbill". Playbill. Retrieved 2017-11-07. ^ "Downtown Drama: Obie Awards To Be Handed Out May 15 | Playbill". Playbill. Retrieved 2017-10-27. ^ "OBIE Awards 2005 - 2006 - six of the award presenters named". New York Theater Guide. 2017-10-19. Retrieved 2017-11-07. ^ "T.R. Knight and Cynthia Nixon to Host Obie Awards". TheaterMania.com. Retrieved 2017-10-27. ^ Desk, BWW News. "2007 Village Voice Obie Awards Winners Announced". BroadwayWorld.com. Retrieved 2017-11-07. ^ "Foote, Hwang, Cromer, Hamilton, Mulgrew and Stew Among 2008 Obie Award Winners | Playbill". Playbill. Retrieved 2017-10-27. ^ Desk, BWW News. "2008 Obie Awards Winners Announced". BroadwayWorld.com. Retrieved 2017-11-07. ^ "Plimpton and Breaker to Host 54th Annual Obie Awards | Playbill". Playbill. Retrieved 2017-10-27. ^ "The 2009 Village Voice Obie Award Winners Announced". Retrieved 2017-11-07. ^ "PHOTO CALL: 2010 OBIE Awards Ceremony | Playbill". Playbill. Retrieved 2017-10-27. ^ "Circle Mirror Transformation Among Winners at 2010 OBIE Awards". Broadway.com. Retrieved 2017-11-07. ^ "2011 Obie Award Winners Announced". TheaterMania.com. Retrieved 2017-11-07. ^ "The 2012 Obie Award Winners". Retrieved 2017-11-07. ^ "Announcing the Winners of the 2013 Village Voice Obie Awards". Retrieved 2017-11-07. ^ "59th Annual Obie Award Winners Announced; Sydney Lucas Is Youngest Winner in Obie History | Playbill". Playbill. Retrieved 2017-11-07. ^ "Inside the 2015 Obie Awards". TheaterMania.com. Retrieved 2017-10-27. ^ Cox, Gordon (2015-05-19). "'Hamilton,' Henderson and Houghton Win 2015 Obie Awards (FULL LIST)". Variety. Retrieved 2017-11-07. ^ "Winners Announced for 61st Annual Obie Awards | Playbill". Playbill. Retrieved 2017-10-27. ^ "Savion Glover, Marlo Thomas and Lisa Kron Among Presenters of Tonight's Obie Awards | Playbill". Playbill. Retrieved 2017-11-07. ^ "Go Inside the 2017 Obie Awards | Playbill". Playbill. Retrieved 2017-10-27. ^ "Presenters and Performers Announced For Tonight's 62nd Annual Obie Awards® | Obie Awards". Obie Awards. 2017-05-22. Retrieved 2017-11-07. ^ McPhee, Ryan (January 17, 2018). "John Leguizamo Will Host the 2018 Obie Awards". Playbill. Retrieved 2018-05-22. ^ Land, Brent (April 3, 2019). "'Crazy Ex-Girlfriend' Creator Rachel Bloom to Host Obie Awards (EXCLUSIVE)". Variety. Retrieved 2019-04-17. Wikimedia Commons has media related to Obie Award.